A group of researchers will explore the underwater battlefields off the coast of Bell Island, to try to uncover more about what happened when four ore carriers were sunk off Newfoundland by German U-boats in 1942. Memorial University archaeology student Daniel Rees, whose great grandmother nursed the injured sailors, was awarded a JR Smallwood Foundation research grant to study the shipwrecks. Rees told CBC Radio's St. John's Morning Show he will use forensic analysis — similar to methods employed by crime scene investigators — to learn about the tactics used by the Germans and piece together how the attacks unfolded. "We can understand the angles the torpedoes would have fired from the German U-boats, we can understand where they would have been in relation to where the guns on the island are that would have been firing back at them, so we can really try to reconstruct everything," said Rees, who received approximately $4,500 from the foundation on Monday. The SS Saganaga and SS Lord Strathcona were struck by torpedoes on the same day, Sept. 5, 1942. 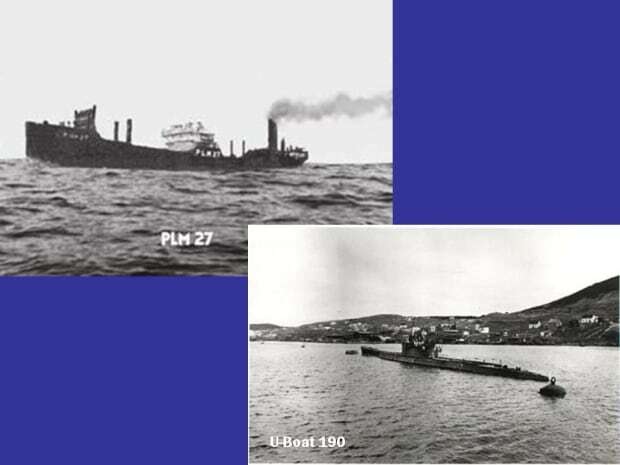 The SS Rose Castle and the Free French Forces vessel PLM27 were hit later that year. In total, 70 men were killed. Rees said while many divers have explored the Bell Island wrecks, his archeological study will include the use of sonar to map the area and also determine the rate of deterioration of the vessels.